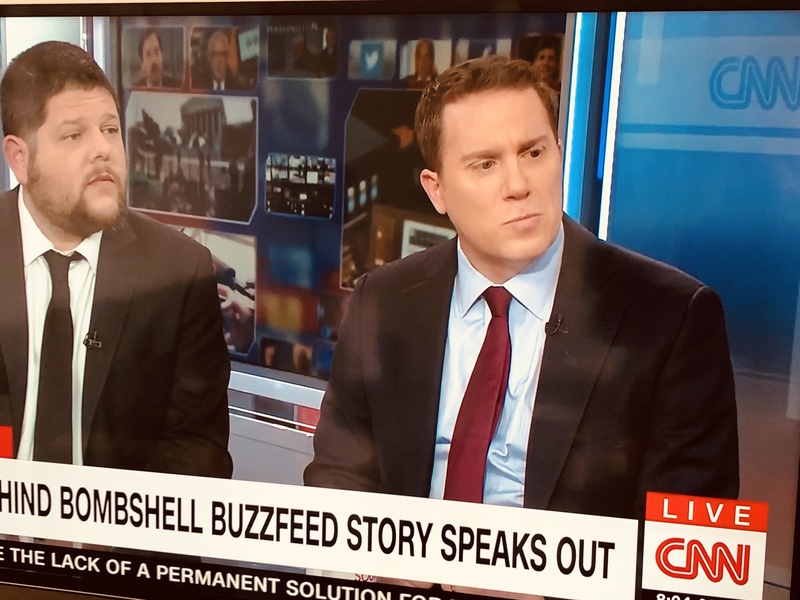 Even for “Reliable Sources” host Brian Stelter, there was no way he could go easy on his first two guests on Sunday’s show: BuzzFeed’s Editor-in-Chief Ben Smith and reporter Anthony Cormier. Cormier is one of two reporters who broke BuzzFeed‘s bombshell story this week that alleges that President Trump directed his former lawyer Michael Cohen to lie to Congress. The other byline on the story is Jason Leopold. When Stelter asked why Leopold wasn’t here, Smith absurdly says Leopold is too busy reporting out the story to do a 20-minute TV hit. They can’t take TWO reporters off the beat to appear on CNN, can they? In the context of BuzzFeed-splaining the story that no reporter in the entire news industry can corroborate, the least Smith can do is not lie about something so dumb. “Ben, where is he?” Stelter asks. Screenshot/CNN: Ben Smith and Anthony Comier appear on CNN’s Reliable Sources. Leopold isn’t here because he was caught plagiarizing earlier in his career. The optics aren’t great. And they all know it. Smith points out the finer points of Leopold’s resumé, as Smith puts it, he was a Poohlitzer finalist and was invited to train CNN employees on FOIA research. He says his mistakes happened some 20 years ago, so who cares? The message appeared to be: Believe him. So what if he previously lied? He’s not lying now. “We’re talking 20 years ago,” Smith says, incredulously, explaining that Leopold is now the nation’s lead expert on FOIA reporting. Cormier is far more preferential from a PR perspective. With facial hair snaking around his large, square face and layering the area under his chin, he sideburns bleed into his beard and he looks like a lumberjack who enjoys buttermilk biscuits. His manner is gentle. He smiles and says all the soundbites Smith will like. Smith looks adoringly at him as he speaks, grinning and on the brink of glee as he spills out folksy talking points. Cormier reminds me of Puck from ABC’s Scandal. He’s the character who takes pliers and yanks out teeth for fun in torture scenes. But he’s gentle and caring and the other characters love him. “We’re trying to get deeper inside the room where this happened,” he says. Cormier defends himself in a soft-spoken, calm manner. What does it feel like to be challenged? This next part makes Smith burst with pride as he watches his reporter talk. “What if the sources are just wrong?” Stelter asks. The pair continuously thanks Stelter profusely for having them on his show. Smith is giddy. He says just an hour ago on CNN’s own Jake Tapper‘s “State of the Union,” Trump’s lawyer Rudy Giuliani was asked if Trump talked to Cohen about his testimony. Giuliani’s answer was: “So what?” The reaction from Congress to this story has been intense — Rep. Adam Schiff (D-Calif.) plans to investigate no matter what Mueller’s office says. The buttering up was relentless. These are not quotes, but this was the unspoken thought bubble I sensed while watching this spectacle. Thank you, Brian. Thank you for letting us come on and tell our side. Oh, Brian, you’re so nice. We love your show. We love you. Did we mention we love you? Smith says he knows that they are here to talk about the “process” of the story, but first he’d like to gloat about how Giuliani’s interview exonerates their piece. “I don’t mean to get away from the process, but that is the heart of what we’re reporting,” Smith says, obviously trying to get away from the process by saying he doesn’t mean to get away from the process. Stelter wants to know if they have more than two sources. Except that’s a sourcing question. “I am not going to talk about the sourcing,” Cormier says. Stelter asks if he has spoken with his sources since the story published. Except that’s a sourcing question. He also won’t talk about the strange discrepancy of his colleague, Leopold, who said that he had seen the documents. Cormier, meanwhile, says he has not. Cormier bypasses the question. He continues his refrain that he won’t get into the sourcing. One sharp point of contention is an email request for comment sent by Leopold to Special Prosecutor Robert Mueller‘s office. “That was a choice he made,” Smith says rightfully. Sounds like a big fat fib on Carr’s part, but so be it. It’s a chance for Stelter to get furious. “Come on, one paragraph? That’s a dereliction of duty to send a three-sentence email,” Stelter says angrily. Stelter brags that when he sends an email request for comment to BuzzFeed, he has bullet points and lines and lines of everything he intends to write. Really. Everything? Reporters are not required and should not offer their stories up for proofreading. But Stelter wants to know why the story ran Thursday. Why not wait for more sourcing? “We published because we were very very confident in the sourcing of the story,” Smith said, explaining that this is a story that has been in the works for a long period of time. The two men pause and share a special moment. “It’s hard,” Smith says. “It is hard,” Stelter sympathizes with him. What really happened? Did Trump use mob talk? “Take care of me, don’t screw me,” Stelter suggests in his best Soprano‘s lingo. Stelter wants to know if Smith is fed up that Mueller’s report is taking so long? Before Smith can answer, the host raises his hand and says, “I am.” Smith tries to explain to Stelter that he isn’t trying to write Mueller’s report for him. Cormier compliments Stelter on a question he asks at the end of the interview that makes me internally wince. “Anthony is there anything I’m leaving out, anything I haven’t asked you?” Stelter asks. Are these three going to kiss? Stelter says, “I greatly appreciate both of you being here and. being transparent. “That’s really important,” Cormier says. “And we really appreciate the opportunity to come on,” Smith adds. “Come back soon!” Stelter squeals.